I’m a whole lot less interesting than three mallards. I’m trying not to take it personally. I took the girls swimming the other day at the Russian River. We were having a nice time splashing around, and Cali was happily swimming after a ball. Jana was searching for rocks. 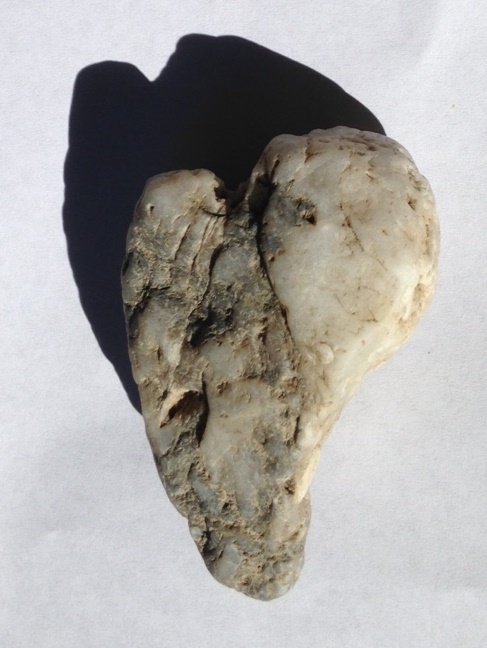 She likes to find heart-shaped rocks, as I have described in an earlier post. She added this one (right) to our collection on this particular river excursion. In short, all was well. Until those darn ducks swam by. There were about 10 ducks, enjoying a sunny day. Jana noticed them first. She’d swim in their general direction, and they’d fly up a few feet into the air, and she’d lose interest. Then Cali got in on the game. She just followed them around, never getting too close. She was no threat. She was holding a tennis ball in her mouth the whole time, and she never got closer than about 10 feet. Three of the ducks decided to play a little game with her. They did not fly away. They stayed just far enough in front of her that they (apparently) felt safe but close enough that she stayed interested. And they swam around in big circles. 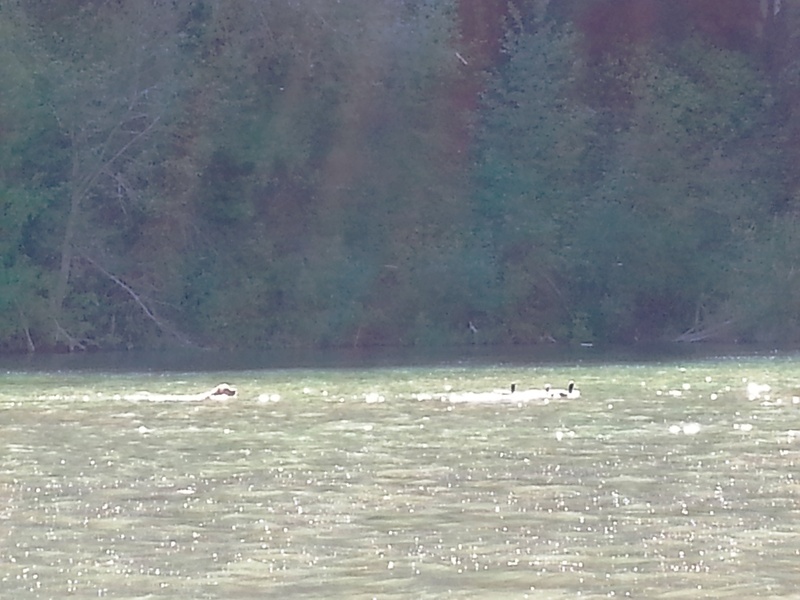 They swam across the river, around a big island, back to our side. Upriver. Downriver. Big circles. Cali paddled doggedly after them. At first, it was funny. She never let go of her tennis ball. She’s a strong swimmer, but after a few minutes, I started worrying that she’d get tired. My friend and I waded farther into the river, determined to head them off if they headed downriver. They didn’t. We called Cali and waved. But she was suffering a bout of duck-induced deafness and never heard a thing. Jana had long since given up on following the ducks and was nosing around for sticks on the beach. The other golden in our group had gone back to tennis balls. But not Cali. Back and forth, around and around. Finally, my friend couldn’t stand it any longer. She crossed the river and grabbed Cali, getting soaked in the process. Cali still had her tennis ball. She was not even winded. Jana used to do the same thing. She once followed a leaping fish pretty far out into the Gulf at a Florida dog beach. But Jana has more sense than Cali. After a while, she looked back, saw how far she was, got a very worried look on her face — and turned and paddled for shore as quickly as she could. I don’t worry about Jana disappearing into the wild. She never wants to lose sight of me. But Cali is more impulsive and less aware of her surroundings. Was Cali even a tiny bit aware that she had worried us? Nothing doing. Within minutes, she was bugging us to throw the ball some more. Does this mean that Cali has a poor recall? Not necessarily; even the best-trained dog is likely to go temporarily deaf when confronted with a really interesting distraction. It does teach me to keep a closer eye (and shorter leash) on Cali when I see ducks on future water adventures, though. And it’s a good reminder that I need to practice recalls with Cali in more places with lots of interesting things going on. I may never be able to cure duck-induced deafness, but I can probably relieve some of the symptoms. Alberta accepts her ribbons after earning her Rally Excellent title. 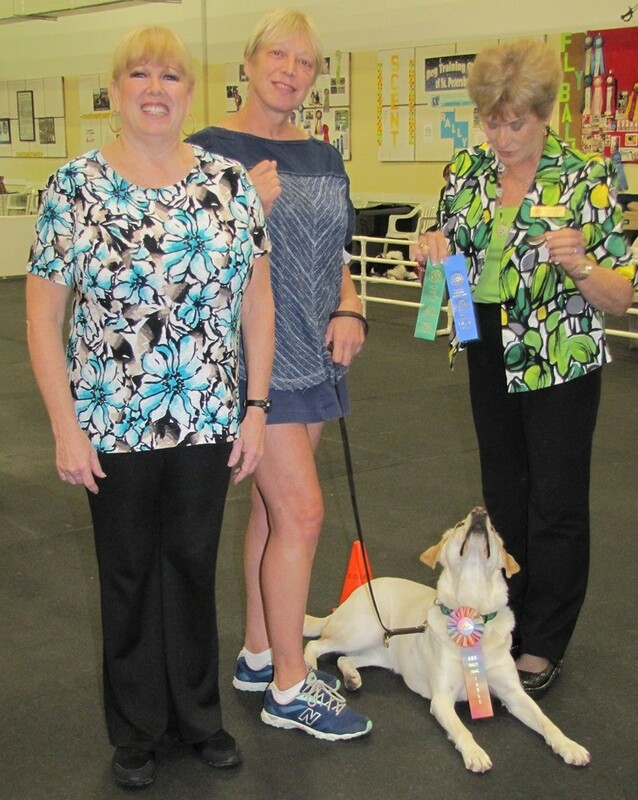 Deni and Alberta are the first guide dog team to earn an Excellent title. They have already two of ten needed “legs” toward their Rally Advanced Excellent title. I’ve watched both formal Obedience competitions and Rally-O (or Rally Obedience) competitions, and the difference is as stark as the difference between traditional training and cognitive education. Both have the same goal: demonstrating a dog’s ability and willingness to follow specific commands when cued by the handler. They use similar sets of commands. Competitors are scored based on the preciseness of the dog’s response, the accuracy in completing the set of commands presented, and the time it takes to accomplish each task. Above the novice level, dogs compete off-lead. Dog-and-handler teams can earn titles in both kinds of competition. Rally is variable. The course is different in every round. The judge sets up the course within an hour of the competition; which exercises are included and in what order is a surprise for handlers and dogs. Formal obedience competitions, on the other hand, follow a set pattern of exercises at every level of competition. 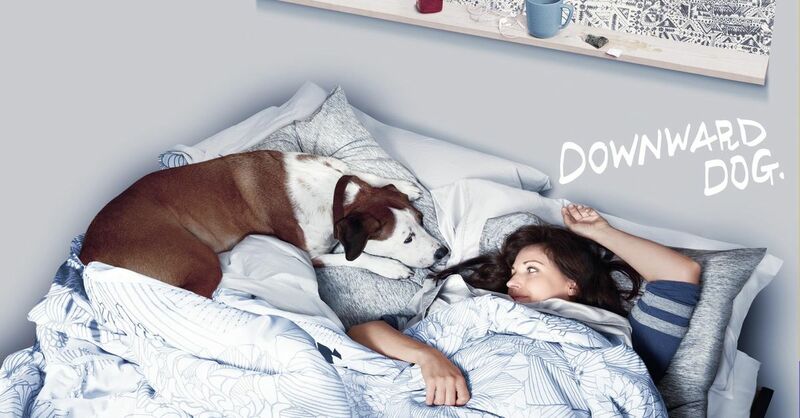 Experienced dogs and handlers could run the pattern in their sleep. While competing, Rally handlers talk to, praise, and encourage their dogs. In the lower levels, the handler can use targeting and clapping or even touch the dog! Formal Obedience handlers cannot interact with their dogs other than to issue each cue, verbally or through hand signal, once. To my (very biased) way of thinking, Obedience competition is all about showing the dog who’s boss (hint: it’s not the dog). Rally is about relationship and having fun. I strongly favor anything that builds relationship between dogs and their humans. Rally acknowledges the uniqueness of how each handler and dog interact as a team. Rally allows each team to excel in its own way. The differences between Rally and Obedience underscore the differences in traditional vs. cognitive approaches to teaching dogs. If all you care about is getting an instant, precise response to a command, traditional obedience will do it for you. But that approach limits what you can accomplish with your dog and defines your relationship inside very narrow parameters. Expecting precise, predetermined, responses to every cue essentially forbids your dog from thinking. There is a single correct response to each cue. Any other response results in punishment or lack of reward. The dog is not allowed to think about how to respond. Nor can the dog think of a better way to respond. When a dog schooled in this way confronts a situation that is slightly different from the training scenario, that dog will not know what to do. If the precise, rehearsed response is not possible or ineffective, the dog faces certain failure. 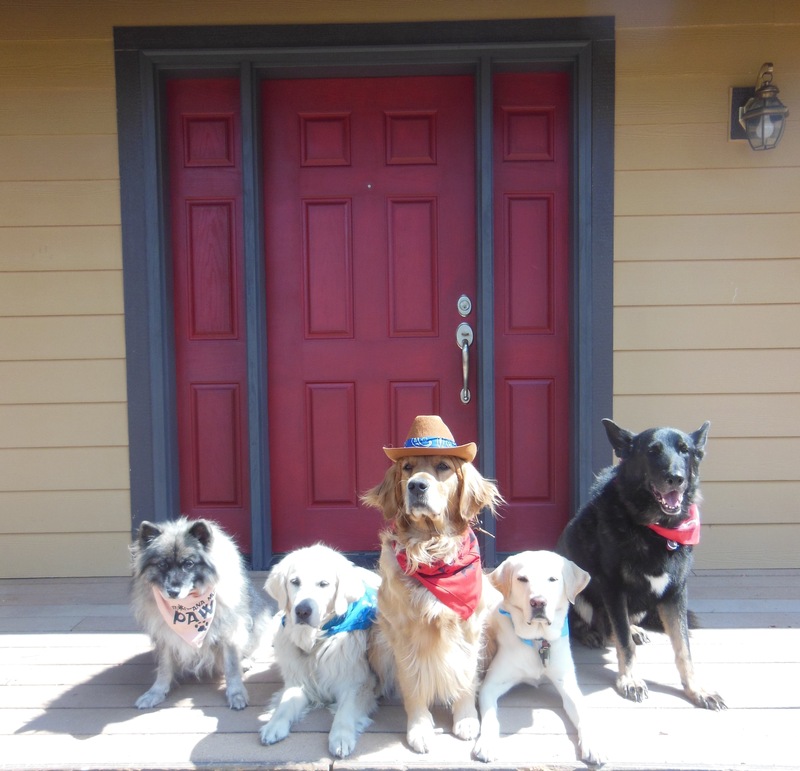 On the other hand, a dog who is taught with a cognitive approach will be able to figure out how to apply his or her learning in a variety of situations. Here’s an example. Let’s say there are two dogs who have been taught to retrieve as part of their education. The obedience trainer, focused on the next competition, polishes his dog’s retrieve. The dog can flawlessly follow instructions to watch where the dumbbell was thrown over a jump, go out over the jump (even if a bad throw makes this the least efficient way of reaching the dumbbell), and bring it back, jumping over an obstacle on the way back. Perfect every time. The cognitive trainer also teaches retrieve, but in a more jumbled way. Sometimes the dog retrieves a dumbbell. Sometimes it is the newspaper on the front porch. As training progresses, a set of keys, a cellphone, a pair of glasses, a spoon, a pen, a bottle of water are added. Sometimes the dog can see the item; sometimes the dog must search for it. Sometimes, it is an item that the handler has dropped. Sometimes it is the pair of slippers in the other room. The dog trained cognitively to retrieve has learned to follow her handler’s point, gaze or verbal cue for the item that needs to be retrieved. Which of these dogs is more likely to fetch your keys if you drop them and they bounce, landing under your car? Which will find your cellphone when you fall and need help? The dog who is trained only to produce a rote response will freeze when the dumbbell is not where he expects it to be or the judge produces a leather dumbbell when he has only practiced with a wooden one. This dog knows the retrieve as a patterned set of responses: sit, stay, go out, come back, sit in front holding the dumbbell, release, finish to a heel position. This is different from understanding the reason behind a retrieve. 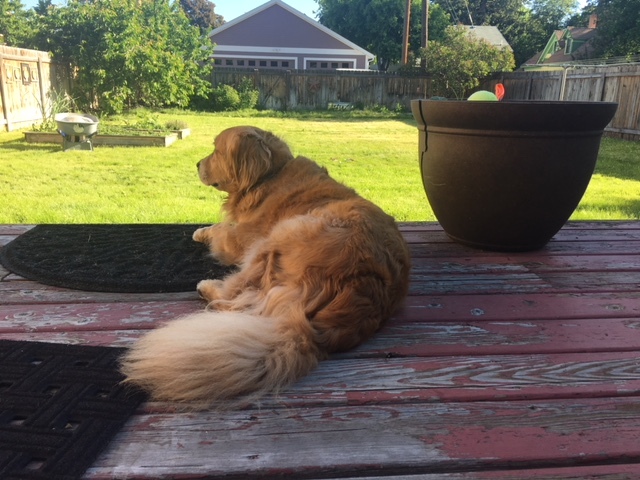 The dog who is trained to think about the retrieve as a practical skill, figure out the goal, and find a solution — the cognitive dog — will size up the situation and, chances are, do what needs to be done, even when it is not expected. I know more than one dog who has taught himself an “automatic retrieve,” picking up anything the handler drops, as a result of this style of retrieve training. Dogs who are allowed to freelance by adding variations to the task based on understanding the goal, will do so. This can come in handy when the handler unknowingly drops important material — like money. Cognitive education enhances communication between dog and humans. Jana spends considerable time on every walk catching up on the local news. 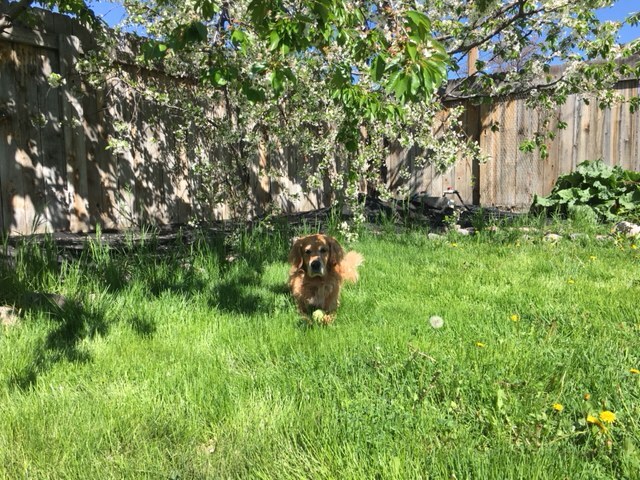 She sniffs out the usual trees and bushes on our daily route. When we take a different route or an extra walk, I know to leave extra sniff time. But that’s not enough for my newshound. Jana does her best to ensure that I, too, have a steady stream of news and information. Knowing how sadly lacking my sense of smell is — and sensing my inability to understand the dog news, should I somehow manage to gather it — she wants me to read the daily paper. Since our recent move, we’ve had Sunday-only delivery of The New York Times. But every morning, Jana has headed to the gate with an eager expression and a spring in her step. Bringing in the paper has been her job. Forever. 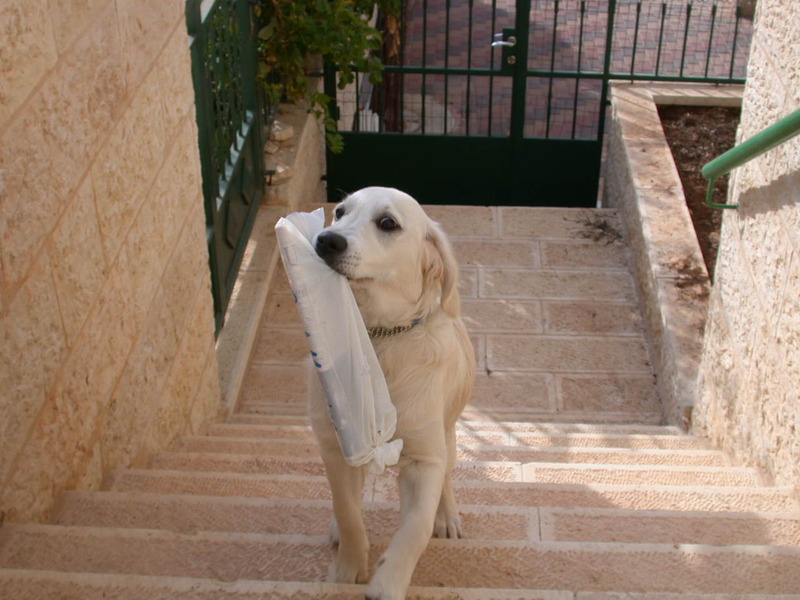 She fetched The Jerusalem Post as a puppy. As a secular dog, she resented the lack of a Saturday edition. She has fetched the Santa Rosa Press Democrat, the St. Petersburg Times (and, more recently, the Tampa Bay Times) and, last year, the San Francisco Chronicle. For the Chronicle, she was forced to fend off a job-stealing challenge from puppy Cali; having held on to her position, she proudly, carefully, carried her prize a great distance to our little rural cottage each morning. So, when we moved to Petaluma, Jana simply could not understand — or accept — my decision to take Sunday-only delivery. Online news access, it seems, is an even more foreign concept to dogs than to us over-40 humans. I am fumbling along with it, but she refuses to accept this transformational technology and the havoc it wrought in her world. I simply could not face the daily sad face, the disappointment. She’d head happily to the gate, and I would open it and show her: no paper. Her head would hang, and she’d slowly walk back to the house. Unemployment. Downsized. Made redundant by a computer. Unneeded. The worst fate for a smart, educated adult. Jana could relate. It was a terrible thing to watch. So, I upgraded my newspaper subscription. Now, our paper appears at the gate daily. Not rain, nor sleet, nor snow … even better than the mail, since we get seven-day-a-week service. Every morning, even before the sun comes up, Jana has a paper to retrieve. Full employment has returned. Jana’s sense of self-worth is restored. Life is good for this thinking dog.